This tungsten ring is meticulously designed by Vincent L. By using multiple castings in the production process, the final product is a ring above all others in the standard of tungsten rings. These tungsten rings feature black and white to exemplify the modern aesthetic style with clean lines and sparkling simplicity. Our tungsten rings are virtually scratch proof, even the black part. As a reassurance, if your 2nd generation black tungsten ring ever gets scratched, we will replace it with another one for FREE. That is how confident we are with the 2nd generation tungsten rings. I've ordered several rings in the past from Titanium Kay....I've never been disappointed. This ring is very nice, unique, and scratch proof, which I love. Cant's wait to place another order. This is the second ring I bought for my husband. The first one scratched easily but he still loved it! But this one, he is ESTATIC over! Thanks Titanium Kay! I bought this ring for my husband. He loves it. The quality is great and the service was awesome. My husband wants to order a second one. Wish you had rings for women! This is about the fourth ring I have purchased from Titanium Kay. It fit perfect, and was even better looking than the picture. I like 9mm wide rings and this one is just perfect with the black band in the middle which matches many of the watches I have. Glad I was able to purchase it on clearance, great buy! Service and delivery are always excellent and would recommend the company to anyone. 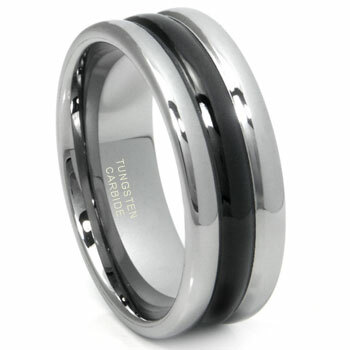 Really like the Tungsten Carbide rings, they don't scratch and always keep their shape and color, what more can I say! I purchased this ring for my wife this past Valentines day. When it arrived, she liked it....but didn't love it. It was very heavy, very wide, but worse, it was too thick to be comfortable. So, I she picked out a different ring and I sent this one back. The replacement ring was much more to her styling and she loves it. Also, it seems the ring, because of the " comfort fit " sizing was too large. She normally wears an 8.5 on the finger the ring was for, but it was an 8 that actually fit. Keep in mind that the " comfort fit " type rings seem to run a little larger than a standard ring. All in all, the exchange was quick and easy, she loves the new ring and we will be shipping with the Titanium Kay folks again very soon!